We were informed by our Berg Adventures operations in Arusha, Tanzania that David and Joanne had a smooth trip and only an hour delay on their long journey to Africa. They arrived at the Kilimanjaro International Airport on the morning of February 14th and were welcomed by our Berg Adventures team. On their way to Arusha where they stay (about an hour away), they made an important planned stop to the Linde school. The Linde school is a school located in the middle of a large field. They educate the rural children, some of the children walk for hours to attend classes. 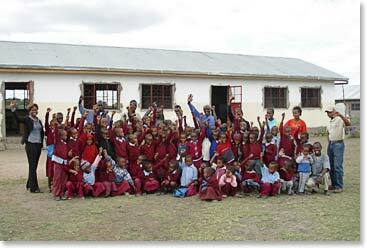 Thanks to donations from very compassionate people including Dave and Darcy Robertson (on our Berg Adventures January 2010 trip), the school is able to stay open. The donations cover the teacher’s wages, food for the children, supplies, school maintenance, and uniforms for the students. All children in Tanzania are expected to wear uniforms at school (to some, this is the only clothing they have). Unlike many areas in the world, a lot of these children don’t have the luxury of bringing a lunch to school. 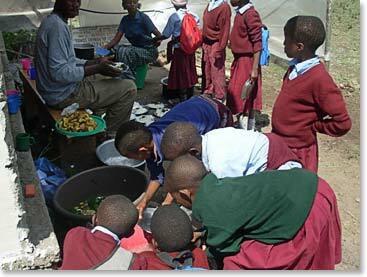 Food is limited, so the school has a local cook on site making breakfast and lunch for the children. David and Joanne spent the day at the school, presenting gifts which they brought from Canada and shared smiles with the children. Later that afternoon, they said their goodbyes to the children and made their way to their hotel for some much needed rest after the long journey. 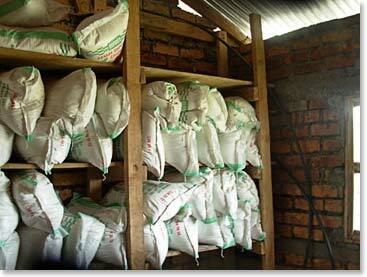 When money is donated and the food is purchsed, it is kept in this storage room at the school.